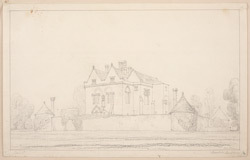 This delicate line drawing depicts the Palace House at Beaulieu, seen from the surrounding grounds. Formally used as a gatehouse to the Cistercian abbey nearby, Palace House displays a variety of architectural styles, such as medieval and Victorian Gothic and 18th century fortification. The abbey was founded under the orders of King John in the 13th century with Palace House being added a century later. The abbey grounds were given to Sir Thomas Wriothesley, 1st Earl of Southampton, following the Dissolution of the Monasteries in 1538. Palace House has remained home to the Montagu family since the 16th century and has entertained numerous royal visitors over time. The property has undergone a number of developments, most notably when a sizeable extension was built in the late 19th century.